Life is very very isolated there, the house is in a little hamlet of about 5 houses and as I told in my last blog, during rainy season it is very difficult to reach. He also told us when he was face to face with a tiger once (! This story my grandsons will like), he told us about local deities, holy trees....a pure delight to listen to him! 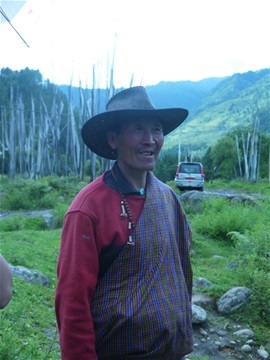 His daughter Pema is the host in the home stay...she is a great cook and she has the most charming smile! It is sold......21.818$ a kilo!!!!!!!!!! Yes you are reading right 21818$! So you see all these remote houses and most of them have cars etc...they can earn quite a lot of money from collecting Cordiceps during a short period in the year!